Donguibogam Village, Sancheong-gun, Friday 6 September, 7am. Four hundred years ago, a ground-breaking medical encyclopaedia was published. 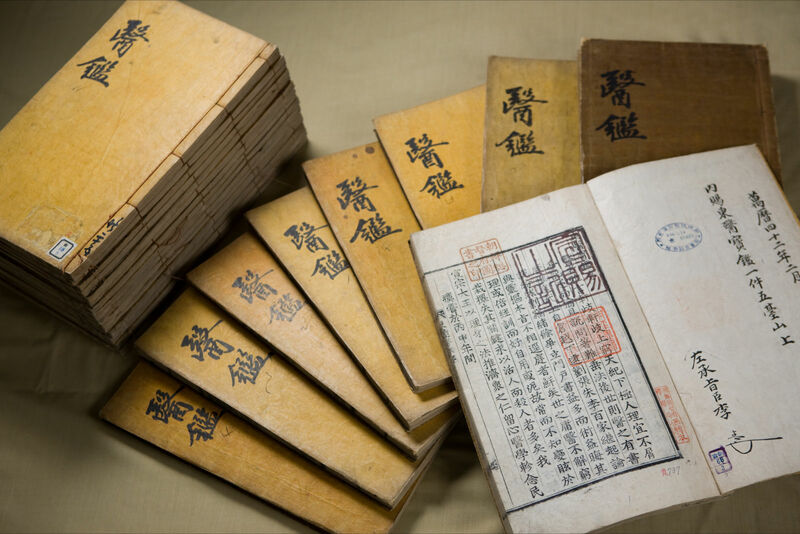 The Donguibogam, literally the Principles and Practice of Eastern Medicine, was compiled and edited by Heo Jun, a Korean royal doctor, with the support of a team of medical scholars and academics. The work had been commissioned by the king, who was concerned at the state of the nation’s health after the ruinous Japanese invasions and occupation of Korea in 1592-98, sometimes known as the Imjin War. Fourteen years in the preparation, its twenty-five volumes set out methodically the state of traditional medicine at the time. In order to make the knowledge more accessible to the general public, some of the text was in Korean script rather than Chinese,1 and described some readily available herbal remedies. The book was distributed nationwide, and can perhaps be thought of as an early example of a state taking responsibility for the health of its citizens. Another feature of the work is its focus on the prevention of disease, not just its cure, recognising that sickness can be caused by an interaction of physical, social and psychological factors. The encyclopaedia brought together the accumulated medical knowledge of several centuries in a unique way and became established as an important reference work not only in Korea but also in China and Japan. Much in demand, it has been reprinted over forty times. For its author Heo Jun it has ensured a special place in contemporary popular culture: among several films and TV dramas based on his life, the 2000 MBC series which bears his name achieved domestic audience ratings of 64%. It was also an early Hallyu hit in Taiwan and Hong Kong, capitalising on the success of Dae Jang Geum, another, probably more famous, drama about a court doctor from the Joseon dynasty which was a huge success in Hong Kong and won an international fan base for its lead actress Lee Young-ae. The medical and historical importance of the Donguibogam has been recognised by UNESCO, which has included it in the Memory of the World register. To mark the four hundredth anniversary of its publication in 1613, four years ago the Korean Ministry of Health and Welfare set out plans to host a celebratory World Traditional Medicine Expo in 2013. Sancheong County, at the foot of Jirisan, and the area with which Heo Jun and the Donguibogam is most associated, was selected to host the Expo. When I first visited Sancheong in 2010, they were still in competition with other locations for the privilege of hosting the Expo, but the results were announced later the same year, giving them roughly three years to prepare. The County had already started on some construction work on Wangsan, where the gi of the Baekdu-Daegan is at is strongest, and the Expo would expand on that initial development. Since then, I have been visiting Sancheong every year and have been able to witness the development of the Expo site. When I visited in 2012 it looked like there was a lot of work still to be done. I had also heard rumours that the budget was running out. But everyone was full of confidence that things would be ready in time. Everything always comes together at the last minute, particularly in Korea. When we had driven through the Expo campus the previous evening, shortly before midnight, it was clear that everything had indeed come together, but we had not been able to see the full extent of the achievements. Today was the day of the formal opening of the Expo, and we were about to find out. The day of the opening didn’t start promisingly. Steady rain brought a certain freshness to the air, which had suffered from the long, steamy summer. Putting a brave face on it, some observers would joke that Heo Jun had a lot of han today; others would enthuse that the rain was bringing down plenteous gi from the heavens. It was all undeniably wet, but the show had to go on, and prior to the official opening ceremony in the afternoon there were other more ancient formalities to be seen to: ceremonies to honour the mountain spirit2 and the spirits of Yu Ui-tae (Heo Jun’s teacher) and Heo Jun himself. We emerge from our chalet to a vista of grey. On a clear day there would be a very pleasant view across the valley towards Hwangmaesan, the mountain where the Royal Azalea festival is held in the springtime, when the slopes of the mountain turn bright pink with the blooms. All we could see this morning was cloud. 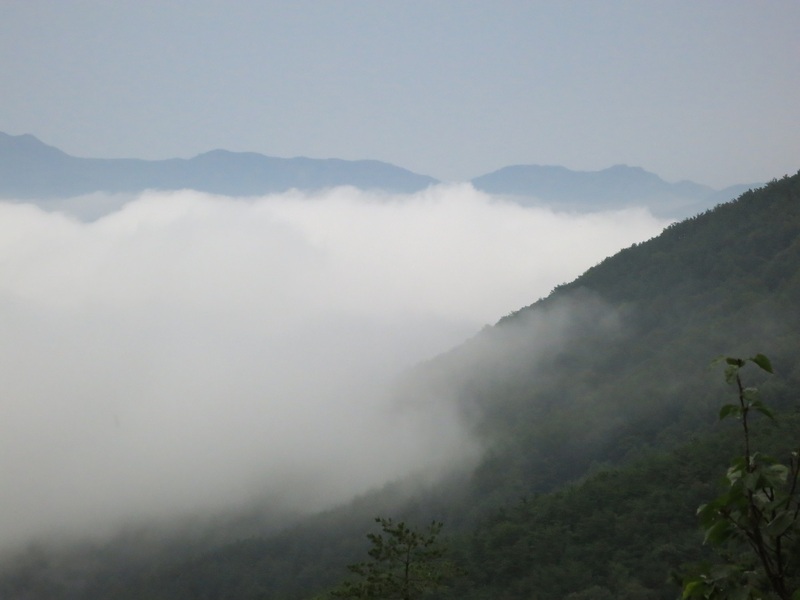 The classic photograph of Korean scenery is a sea of cloud through which poke the peaks of mountains, extending like floating islands far into the distance. Very picturesque, but it means that if you’re not actually on a mountain top, you’re submerged in the low cloud. And that’s precisely where we were. It was damp, but the air was fresh and cool. It was the last time we would feel cool during the course of the day, which became hot, sticky, and much wetter. As we drink our morning coffee, Kyung-sook briefs me about the running order for the day. The morning will be taken up with the various traditional ceremonies; we’d find lunch somewhere; in the late afternoon would be the official opening formalities followed presumably by dinner. And sometime in the afternoon I was going to have to record an official welcome message for a video which would mark the opening of the Expo. Ah. That last bit was news to me. I hate talking to camera. Often in London a Korean reporter will come up to me with a video camera to ask for my views on, say, the concert we have just seen. I always run fast in the opposite direction unless I’ve had plenty of warning and time to prepare. And now I had been given both. I get very well looked after when I am in Sancheong, so I don’t mind singing for my supper in exchange, and I’m sure such duties are an expected part of being a goodwill ambassador. Three sentences will be enough, I am told. So I start crafting three bullet points congratulating the project team on their huge efforts, praising the ground-breaking publication of the Donguibogam four hundred years ago that this festival is commemorating, expressing a wish that the festival will spread the word of the Donguibogam throughout Korea and the world, and generally wishing for a successful festival. Oh dear. That makes four bullets. Plus, “it’s not a Festival, it’s an Expo,” corrects Kyung-sook. And, “as the Expo is partly state-sponsored, you shouldn’t praise the local Sancheong team too much. The Festival is at the end of the Expo,” she continues. “That’s when you should be praising the Sancheong team.” Or maybe it was the other way round. To clarify, or probably not: Sancheong has an annual Herbal Medicine Festival which is normally held at the beginning of May. This year the County is also hosting Korea’s first ever International Traditional Medicine Expo, commemorating the 400th anniversary of the publication of the Donguibogam in 1613, which will henceforth be held every three years. Because of the Expo, this year the County has moved its annual Festival so that it is tacked on to the end of the Expo. Either the Festival or the Expo is primarily funded locally, while the other has some funding from the Ministry of Health and Welfare. But which is which I can’t remember now. I finally agree my three bullet points with Kyung-sook, not a moment too soon, as it’s time for the first of the ceremonies. We drive down the hill from our chalet to the Gi Experience Village at the top of the Expo grounds to our first appointment of the day.